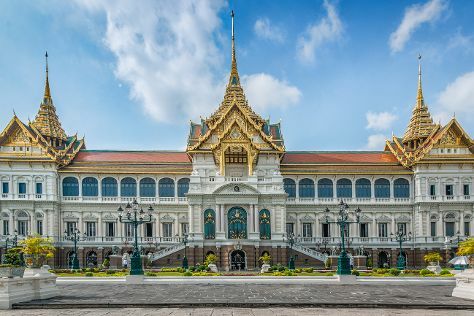 Kick off your visit on the 20th (Sat): explore the activities along Chao Phraya River, soothe aching muscles at some of the top local wellness centers, then take in the spiritual surroundings of Temple of the Golden Buddha (Wat Traimit), and finally take a stroll through Chinatown - Bangkok. On the next day, browse the different shops at MBK Center (Ma Boon Khrong Center), then stroll through Lumpini Park, and then browse the different shops at Asiatique The Riverfront. For traveler tips, maps, ratings, and other tourist information, read Bangkok journey builder app . Dublin, Ireland to Bangkok is an approximately 17-hour flight. The time zone difference moving from Greenwich Mean Time (GMT) to Indochina Time (ICT) is 7 hours. Plan for much warmer temperatures traveling from Dublin in April, with highs in Bangkok at 41°C and lows at 31°C. Wrap up your sightseeing by early afternoon on the 22nd (Mon) to allow enough time to travel to Chiang Mai. Take a break from Chiang Mai with a short trip to Wat Phra That Doi Suthep in Doi Suthep, about 1h 15 min away. Spend the 24th (Wed) wandering through the wild on a nature and wildlife tour. The adventure continues: explore the ancient world of Wat Chedi Luang Worawihan, stroll through Chiang Mai Zoo, contemplate in the serene atmosphere at Wat Phra Singh, and pause for some photo ops at Roitawarabarn Baandhawalai - Porter house. For traveler tips, more things to do, reviews, and other tourist information, you can read our Chiang Mai trip itinerary planning website . Do a combination of train and flight from Bangkok to Chiang Mai in 3 hours. Alternatively, you can do a combination of bus and flight; or drive. Traveling from Bangkok in April, you can expect nighttime temperatures to be a bit cooler in Chiang Mai, with lows of 28°C. Finish up your sightseeing early on the 25th (Thu) so you can travel to Patong. Take a break from Patong with a short trip to Phuket Big Buddha in Chalong, about 46 minutes away. Spend the 27th (Sat) among aquatic life with a scuba or snorkeling tour. There's lots more to do: kick back and relax at Patong Beach, tour the pleasant surroundings at Kata Beach, soothe aching muscles at some of the top local wellness centers, and have some family-friendly fun at Phuket Kart. For other places to visit, traveler tips, where to stay, and more tourist information, read our Patong route planner. Traveling by flight from Chiang Mai to Patong takes 3 hours. Alternatively, you can drive; or take a bus. Traveling from Chiang Mai in April, expect nights in Patong to be about the same, around 28°C, while days are slightly colder, around 38°C. Finish up your sightseeing early on the 29th (Mon) so you can travel to Ko Phi Phi Don. Spend the 29th (Mon) among aquatic life with a scuba or snorkeling tour. And it doesn't end there: explore the activities along Maya Bay, Head underground at Ko Phi Phi Le, explore the striking landscape at Viking Cave, and kick back and relax at Laem Tong Bay. To see traveler tips, reviews, photos, and tourist information, read Ko Phi Phi Don journey planning site . Traveling by combination of taxi and ferry from Patong to Ko Phi Phi Don takes 1.5 hours. 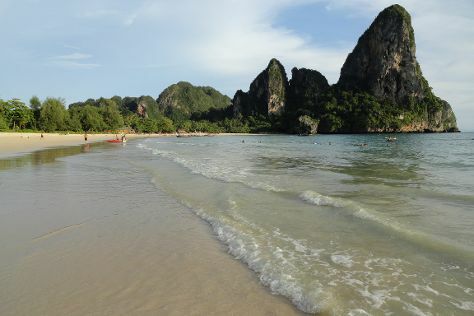 In April in Ko Phi Phi Don, expect temperatures between 39°C during the day and 28°C at night. Cap off your sightseeing on the 1st (Wed) early enough to catch the ferry to Krabi Town. Start off your visit on the 1st (Wed): stop by Armani Collection. Get ready for a full day of sightseeing on the next day: stop by Alex's Fashion, look for gifts at Scandi Fashion, then tour the pleasant surroundings at PhraNang Cave Beach, and finally tour the pleasant surroundings at Ao Nang Beach. To see more things to do, other places to visit, ratings, and tourist information, refer to the Krabi Town road trip tool . Getting from Ko Phi Phi Don to Krabi Town by ferry takes about 1.5 hours. Other options: do a combination of ferry and bus. Expect a daytime high around 39°C in May, and nighttime lows around 28°C. Finish your sightseeing early on the 4th (Sat) so you can travel to Bangkok. Start off your visit on the 4th (Sat): take in the spiritual surroundings of Temple of Dawn (Wat Arun), then contemplate in the serene atmosphere at Temple of the Emerald Buddha (Wat Phra Kaew), then step into the grandiose world of The Grand Palace, and finally contemplate in the serene atmosphere at Wat Pho. Get ready for a full day of sightseeing on the next day: get a taste of the local shopping with Chatuchak Weekend Market, buy something for everyone on your list at Siam Paragon, and then admire the landmark architecture of Jim Thompson House. To find maps, traveler tips, more things to do, and tourist information, use the Bangkok tour itinerary maker . Getting from Krabi Town to Bangkok by combination of bus, flight, and train takes about 4.5 hours. Other options: do a combination of bus and flight; or drive. Traveling from Krabi Town in May, plan for a bit warmer nights in Bangkok, with lows around 32°C. Wrap up your sightseeing by early afternoon on the 6th (Mon) to allow time for travel back home.